The world’s most timorous rodent returns for another nonadventure. 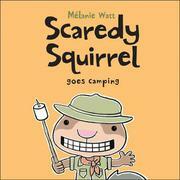 Scaredy Squirrel has no desire to go camping—“the rugged wilderness” is just too darn scary. Why, out in the wilderness he might encounter quicksand, the Three Bears, penguins and zippers, among other perils. So he resolves to enjoy camping vicariously, via his new television. But electrical outlets are few and far between in the woods, and it looks like Scaredy will have to venture out through the wilderness to a nearby campground to plug in. He assembles his survival kit (“really long extension cord,” cement, dictionary and fan), dons his “wilderness outfit” (zipper-free), makes a plan, plots a route, does some calisthenics and, when conditions are right (sun = go; volcanic activity = cancel), sets out. All’s going well until—gasp—a penguin (a mini-golf fixture) appears in his path! Scaredy does what he does best: panics and then plays dead. When he wakes, it’s to a glorious sunset and the realization that the wilderness may not be so bad after all. Watt and Scaredy hit all the right notes, hewing to the now-familiar formula. While the execution may no longer be startlingly original, that’s not what Scaredy or his fans are after. The irony of a wilderness-fearing squirrel that lives in the wilderness is especially funny in a camping-avoidance context, and the ending is nothing less than sublime.